← Yes there is snow! I have never in my life bought anything from the Home Shopping Network. But there I was with my husband watching HSN the other night. I think he was channel surfing and must have stopped for a moment and that was all it took. It was over for us. We were two hypnotized idiots. We couldn’t take our eyes off the screen. It really is amazing how persuasive the hosts on that channel are. You are powerless to their charms. It’s as if your life will not be complete if you do not jump up and purchase the item they are selling. And you better hurry because they are running out of that very item at that very minute! I see why I never watch this channel. I am easily persuaded and I would be broke. 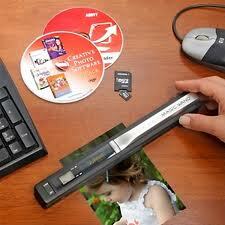 Well there we were hooked on the VuPoint Magic Wand Portable Document and Photo Scanner. The man and woman hosts on the television were telling me how much I needed one to make my life clutter free. They were scanning everything receipts, kids art work, Christmas Cards, recipes everything. So simple- scan it and throw it out. In addition you can scan, restore and digitize old photos. I quickly had visions of becoming a paperless household with no paper clutter anywhere. What a wonderful world that would be. As well as being able to restore all my grandmother’s photos from her albums and reaffirming my position as her favorite grandchild. My husband turned to me and said, “You better go downstairs and order it.” So off I went still hypnotized by promises of scanning everything I own. Thankfully there were a few hundred left and I was easily able to purchase my magic wand for $94.40 including tax and shipping. At the time of this posting the HSN is out of stock of this item, I guess I wasn’t the only one, and the price has returned to $199.90. So at the end of the day I think I got a good deal, but did I need it? Probably not. I think I will stay off the HSN. Do you think it was a bad idea to sign up for daily emails? I’ll let you know. This entry was posted in Shopping and tagged Home Shopping Network, HSN, Impulse buy, Magic wand scanner, Paperless, portable scanner, restore photos, scan photos, Vu Point Magic Wand Scanner. Bookmark the permalink. Thanks for following my blog and stay away from that channel!!! haha! Actually I think the scanner is a great idea and I really want one too…clutter is becoming my middle name and it’s driving me crazy. Thanks for reading! There is an update to this post- we have received out vupont scanner and it is awesome. I already used it to scan some old pictures of my father for my blog. You should get one. I will take your advice and walk away a winner, with my portable scanner.